Appellation or Vine Soave D.O.C. This Superior D.O.C. Soave is obtained by Garganega grapes, which originate from the vineyard of the plains of Albare. They are left to mature according to the technique of "double maturing". This particular technique consists in cutting the vines in such a way that some bunches of grapes are left to mature on the plant and others are not. The vinification process is carried out in steel containers. Its yellow straw color is of good concentration. It's scent is refined and of an excellent intensity. 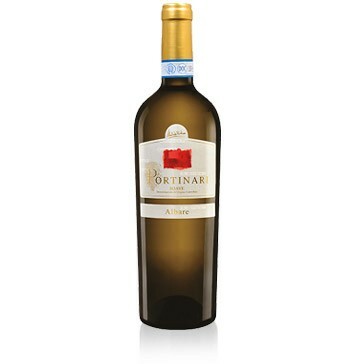 There is a slight touch of dried fruit, almonds, white flowers, straw and golden apples. When in the mouth the texture is fresh and soft. It has a persistent finale and an excellent taste-scent quality to it. The vineyards belonging to the Portinari family in the first decade of the 1900s were cultivated by third parties. Umberto Portinari began cultivating the vines at the beginning of the 80s gradually continuing the vinification process of the grapes produced. The company is divided in two plots of land: Ronchetto and Albare, which give two "Soaves" with very different characteristics. In the vineyard of Albare, Umberto applies the technique of "double maturing" or of the cutting of the shoot, which allows for a better structure to the wine. The cellar and the home are in Brognoligo, in the outskirts of Monteforte d'Alpone and completely surrounded by the viny hills. Aperitif, main dishes, white meat, fish, shellfish, salad, eggs. The temperature of the service is 11-13°C, a large tulip shaped glass is advisable. It may be drunk while still young, but it is advisable to let it thin for a few years in a cool place with a constant temperature.